The most popular European Ryder Cup star Ian Poulter is currently on a four month break from golf activities following a foot injury. He is having a lot of free time now. Ian had a small commentary stint with the Sky Sports team for the Royal Troon event. After the successful commentary stint, he has now turned at the Woburn Golf Club last week to offer support to the women’s golfers pitting it out for the Ricoh Women’s British Open. He is also there at the Open to support Charley Hull, his fellow Woburn is touring professional. He was quite impressed with how to golf course for the Ricoh Women’s British Open has shaped up. He even gave some tips on how to play on this golf course in an effective manner to earn good results. He said that he was there on the course to enjoy every bit of women’s golf. Poulter said that he occasionally gets together with Hull during the summer. Ian said that he and Hull had jointly competed for an event on this golf course during the start of July and that event was called the Duke. Ian felt that the 20 year old Hull was a confident, exciting and a bubbly player with a very good presence of mind. She has to soak in all the home town support that she gets and perform at her best. Ian has huge expectations about Hull and her golfing skills. She is currently ranked no 27 in the world and Poulter is confident that she will scale up the rankings ladder pretty soon. 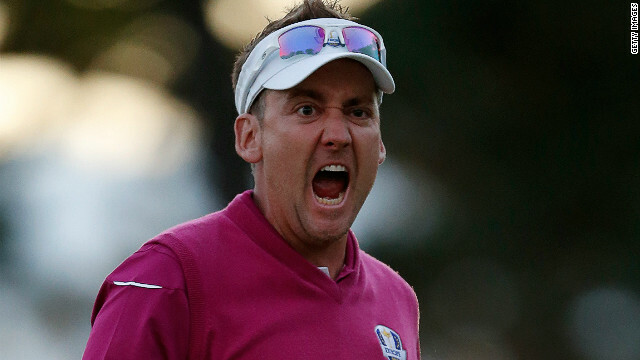 Poulter is very proud that Hull has made it to the Great Britain Rio Olympics team. Meanwhile, Ian Poulter is slowly getting over his foot injury and might sometimes miss the chance to play in the European Ryder Cup team due to the injury.